In windows 7, I want to search for all files containing “a word or phrase in the file”, like in the standard XP search box. I do NOT want to say the file name; file type; drive letter; etc. – or anything like that. I tried searching for this type of thing but just can’t find any discussion about it. And of course, not having this type of search is kind of driving me insane. It is exactly what we have a computer for. No 3rd party programs please. I’ve been looking into this because I know the search has been failing me as well. I think the difference in whether Windows search works or not depends on the FILE EXTENSION which contains your search text. For example, if you look for the word “spam”, it will be found if it is in a whatever.doc file, or whatever.txt file. However, if you were to rename the file to whatever.xyz, it would no longer find the word. 1. 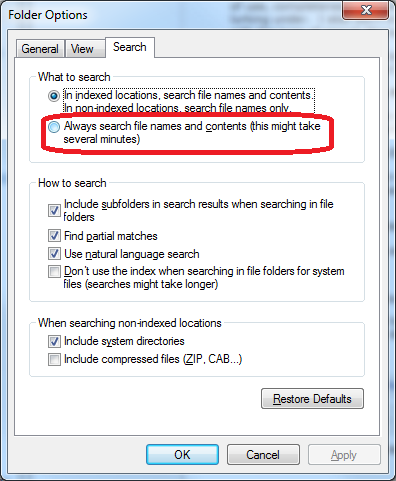 Make sure that Windows 7 is actually going to search files with your extension, and it appears that using this list properly is important *whether or not you are looking in an indexed location*!! a. Hit the start button and type “search” in the search box. d. Select the “File Types” tab. e. Make sure the file extension for the files you want to search in is on the list *and* is set to “Index Properties and File Contents” (yes, pick your jaw up off the floor). I know this appears to be for file indexing, but it does seem to make a difference on whether you find the file in non-indexed locations as well. 2. Actually perform your search on the folder in question. Depending on some other settings you may have to type “content: spam” to find “spam” *in* the files instead of files with the word “spam” in the name. Alternately, if you press the “Alt” key when you’re exploring in the folder, you can choose “Tools / Folder Options” go to the “Search” tab and select “Always search file names and contents”. If what I have written is actually correct, then IMHO Microsoft has coughed up the ball bigtime on this one. Personally, I now recognize that I can’t use the search feature, and I’m installing Cygwin so I can use “grep” to search the contents of files. Not cool and not amused. Good luck to all the searchers.